Home » Blog » Renting Vs Buying: Which One Makes More Sense? Given today’s real estate market, it’s not surprising that the most popular podcast episodes of this year featured Hilliard MacBeth discussing his book, When The Bubble Bursts, Surviving the Canadian Real Estate Crash, and Ben Rabidoux sharing his thoughts on the Canadian real estate market. Listeners want to know if they should rent or if they should buy? While I am not a real estate expert, I want to help those who are trying to decide by comparing the different possible outcomes of renting vs buying. From our own Joe Debtor study, we know that home owners in high ratio mortgages are at an increased risk of becoming insolvent. The average insolvent home owner had a mortgage ratio of 90% and owed over $68,000 in unsecured debt. Why? Because most people focus on the mortgage payments and forget to pay attention to all the other costs associated with owning a home. To help determine which one is a better option, I run through a few scenarios in the podcast. 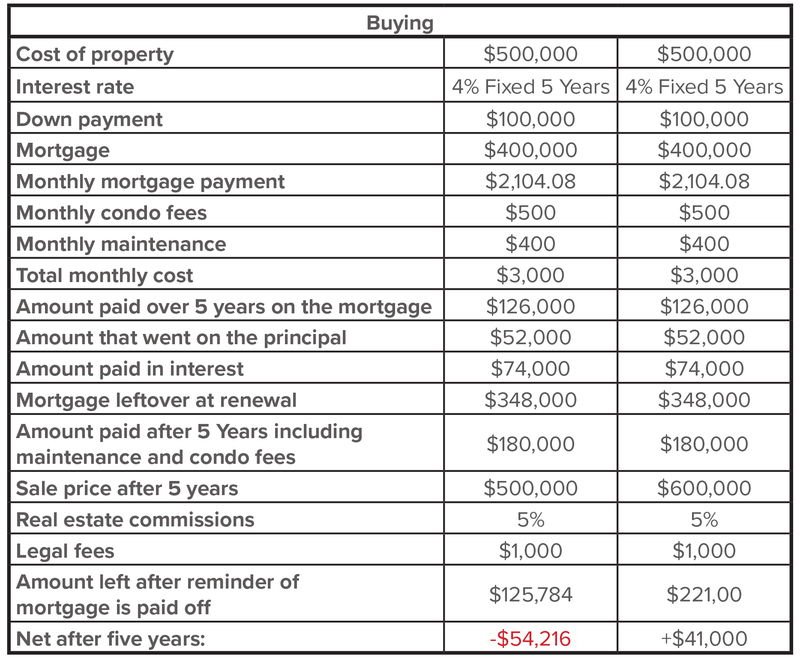 Please note that numbers are rough estimates for the general costs associated with owning and selling a home at the five year maturity date, and that the math has been simplified to help illustrate a point. How much you will come out ahead obviously depends on how much the value of your home increases, but did you notice just how much other costs eat into that appreciation? What happens if you rent? I looked into the costs of renting a $500,000 home and the average monthly rent was about $2,400 a month. Assuming you take the $100,000 down payment and invest that money in a TFSA, what would happen after five years? Depending on the rate of return, you pay anywhere from $39,000 to $17,000, which isn’t bad considering you had a place to live for 5 years. But how does renting compare with buying? If the Canadian real estate bubble continues to grow, you could potentially come out ahead by $41,000. In this scenario, purchasing a home makes more sense. However, if the Canadian real estate bubble bursts and house prices stagnate, you could lose, in our scenario, up $54,216 over the five years, making renting a much better option. Especially, if you are able to get a good rate of return on your investment. When comparing the two options, you need to consider all the factors, from your down payment, to the interest rate, to how long you plan to live there. Of course, there are also other factors that can have an impact on your decision to rent or buy, such as: the flexibility to move, being able to have pets, and to paint or decorate as you wish. What do I think my house will be worth in five years? What will it be worth in two years? What will it be worth when I decide to sell it? What do I think interest rates are going to be? Are interest rates going to keep going down or are they going to go up? What happens if I have to renew my mortgage at a higher interest rate in the future? Are you in a very secure job that you’ll have for the next 20 years? Or, are you in a job where there’s a chance you might get laid off? Ultimately, run the numbers to see what makes the most sense in your situation and do not let FOMO (the fear of missing out) guide your decision making process. Is the Canadian Housing Bubble about to Burst? 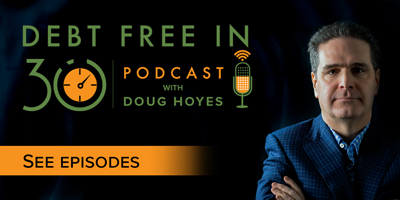 Doug Hoyes: I can track how many people download the podcast version of each episode of Debt Free in 30 and I can tell you that so far in 2016, the most downloaded episode is episode 89, titled “Is the Real Estate Bubble About to Burst”, with my guest Hilliard MacBeth. Mr. MacBeth literally wrote the book on this topic with the book When The Bubble Bursts, Surviving the Canadian Real Estate Crash. Episode 94 with Ben Rabidoux, where we also talked about real estate was also one of our top downloaded real estate episodes so that tells me something. It tells me that Canadians are interested in whether or not they should be buying or selling real estate. 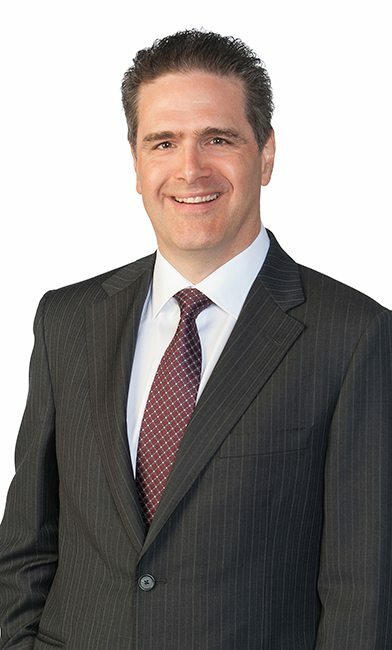 Unlike Hilliard MacBeth and Ben Rabidoux I’m not a real estate expert, I have no idea if real estate in Ontario and Vancouver will keep going up or whether it will crash. I’m recording this in July, 2016 so if you’re listening to this podcast at some point in the future you may already know the answer to that question. But as of today, I don’t. But here’s what I do know, you can make a lot of money in real estate but you can also lose a lot of money. When your house goes up in value, it’s great, when it doesn’t, well, it isn’t. And I know from past history that real estate problems have been an issue for people who ultimately end up having to go bankrupt or file a proposal. Every two years we do our Joe Debtor study where we take a look at what the profile is of a person who ends up filing a proposal or going bankrupt. When we last did this study last year, one in four, so about 24% of the people who file a bankruptcy or do a consumer proposal, own a home at the time that they file. The average mortgage outstanding at that point in time is just under $200,000. However these are not average mortgages. The average insolvent home owner had a mortgage ratio of about 90%. In other words 90% of the net realizable value of their home was encumbered by debt. The typical home owner was around 46 years old, they had an average net monthly income of just under $3,000. But they also had total unsecured debt of over $68,000. So, think about that. They’ve got a mortgage of around $200,000 but they’ve also got other debt, credit cards, bank loans and so on of over $68,000. And when you break it down in fact personal loans were about $26,000, credit cards were almost $30,000. They also owed something for taxes, student loans and some other debts. So, why is that? Well, one of the reasons is when you buy a house, you need to furnish it. You need to do some landscaping, you need to do some repairs, need to put a new roof on it, got to paint it, got to do this, got to do that. All of those things cost money. And that’s one of the things people will when they’re buying a house. They look at the numbers and then go okay, well the mortgage payments going to be this much a month, I can afford that and they forget about all of the other things. So, what I’d like to do today is give you my thoughts on real estate. And I want to give you how I think about this decision should I buy a house or not, should I sell my house or not. I’ve been talking to a lot of people this year who own houses that have gone up in value, but they also have a bunch of other debt just like I talked about with our typical client. And so, they come to me and they say hey, what should I do? Well, it’s a difficult decision. On the one hand if you sell your house you can cash in, get some money and use that money to pay off your credit cards and bank loans. But then of course you don’t have a place to live, you now either go to buy a smaller place or you’ve got to rent. Does that make sense? Well, that’s what we’re going to talk about today. I also talked to other people who perhaps have gone through a bankruptcy or proposal, they’re finished, they’re credit’s starting to look good, they’ve done some things to repair their credit and now they’re deciding should I buy a house or should I continue to rent? Well, we’re going to talk about the thought process behind that decision today as well. Obviously the answer depends on what the real estate market is going to do in the future. In places like Vancouver and Toronto, it’s been going up literally for years and years and years. If it continues to do that, then yeah, I guess buying is a good idea, interest rates are pretty low right now. If they stay low, again buying is a good idea. But if interest rates go up or if the economy slows down and as a result real estate prices go down, not so good an idea. So, how do you actually think through that decision? Let me give you an example. And here’s how I would do it. I’m going to pick a mythical property and I’m going to assume that that property sells for $500,000. Now this could be a good sized house in a place outside of Toronto or it could be a relatively small condo in Toronto. Let’s assume that you’ve got a $100,000 saved up as a down payment. Now I understand a lot of people aren’t going to have that but to keep the math simple, let’s assume that. Let’s assume that you can go out and quality for a mortgage, a five year fixed rate of 4%. If you’ve got really good credit you’re going to actually get a mortgage interest rate lower than that right now but let’s again to keep the math simple, assume you’re going to buy a $500,000 downtown in Toronto, you’re going to have $100,000 down payment, you’re going to end up with a mortgage for five, locked in at 4%. So, if you amortize the mortgage over 25 years, so the rate is guaranteed for the first five, but you’re going to be paying it off over 25 years, your monthly mortgage payment would be $2,104.08. So, let’s assume you’re going to live in this place for five years. You’ve got a five year mortgage locked in, you’re going to live in it for five years. Well, after five years if you pay $2,104.08 every month for 60 months, after five years you’ll have paid just over $126,000 in mortgage payments. The balance of your mortgage at the end of five years, obviously your mortgage started out at $400,000 ’cause you had $100,000 down payment, at the end of five years, your mortgage balance will be just over $348,000 so you will have paid down just under $52,000. The difference of course is the $74,000 you paid in interest. Now let’s assume the maintenance fees are $500 on this condo that you’ve bought. If you are buying a house, well there aren’t maintenance fees but obviously you’ve still got property taxes and things like that so again I’m keeping round numbers just to keep it simple. If you own a place there’s also repairs and maintenance, the fridge or the stove or some light fixture or something goes wrong you’ve got to replace it, you’ve got to clean the carpets, you might have to repaint. So, let’s throw in another $400 a month for repairs and maintenance. And I realize some months you don’t have to pay anything, other months you’re going to pay more than that. But let’s assume over the course of the five years it averages out to around $400 a month. So, to own the condo or the house you’re going to need $100,000 down payment and you’re going to pay mortgage payments of $2,100 a month, maintenance fees and property taxes of $500 a month and repairs and maintenance let’s say $400 a month. So, roughly that is about $3,000 a month to own this $500,000 condo. So, what would it have cost to rent this exact same place? Well, I went on the internet and did some searching around and you can probably rent the exact same place for about $2,400 a month. And in fact I had a meeting with a property manager back in June and that person told me that yeah, the average investor she works with who owns a condo and she then rents it out for them, is cash flow negative somewhere between $300 and $600 a month. In other words the investor takes the money from the renter to pay the mortgage and condo fees and everything else. But it’s not enough to cover all the costs, so each month the investor who owns the condo and is renting it out, has to kick in somewhere between $300 and $600 a month. Well, that’s what my numbers are showing as well. So, let’s do a comparison here. Let’s assume that I’ve got $100,000 for the down payment and I’m either going to buy the $500,000 condo or I’m going to rent that exact same condo. So, option number one, I’m going to rent it. So, let’s assume I take my $100,000 down payment and I invest it ’cause obviously I don’t need it., I’m not buying a place. And let’s assume I can earn 1% a year on it after tax. So, maybe I’m earning 1% in my TFSA so there’s no tax on it or maybe I’m earning more than 1% but I pay the tax on it. So, I can rent and pay $2,400 a month in my example. So, after five years I’ll have paid $144,000 in rent and I will still have original $100,000 investment. So, with the interest at 1% a year, it’ll have grown to about well just over $105,000 after five years. Now of course if I can earn more than 1% I’ll have more. If I can earn let’s say 5% a year, then at the end of five years I’ll have $127,000. But let’s keep it simple, let’s assume I only earn 1%. So, I paid $144,000 in rent, I have $105,000 now in savings at the end of five years, so my net cash reduction over those five years was well, $38,889 to be exact. But let’s assume it’s roughly $40,000 and that makes sense because I actually had a place to live for five years. So, makes sense that it would have cost me something. Now let’s look at the second option, buying. So, let’s assume I can buy the condo for $500,000 and I’ll use my $100,000 in savings for the down payment. So, I go out, I get my mortgage and as we went through all the numbers I’m going to pay over five years let’s say about $3,000 a month, which is about $180,000 over five years. So, my net cash drain is $180,000 as compared to only $40,000 for renting. But of course that’s not a valid comparison because I still own this condo I just bought. I own a condo that now has a mortgage on it after five years that has been paid down to just over $348,000. So, let’s assume I could sell it for exactly what I paid for it, $500,000. I’d have to pay real estate commissions of let’s say 5% and I’d probably have $1,000 in legal fees to sell it. And let’s assume that there are no penalties to break the mortgage because I locked in for five years and now it’s maturing and now I’m selling. So, I sell for $500,000, pay the $25,000 in real estate commissions, pay $1,000 in legal fees and I pay off the mortgage of $348,000. So, I’m left with about $125,784. So, I paid out $180,000, $3,000 a month while I lived in the condo for five years. Obviously that included my condo fees and repairs and maintenance and everything. But I recover about $126,000 when I sell. So, my net cost for five years was about $54,000. So, to compare, renting cost me $40,000 for five years, owning cost me $54,000 over five years. In this example renting was better from a numbers point of view. Of course I can change the assumptions and get a different answer. If the home went up in value over five years, so instead of being worth $500,000 at the end of five years, let’s assume it was worth $600,000. Well, in that case when I sold it, my real estate commissions would have been a little bit higher but I would have netted about $221,000. So, my cash costs for those five years were actually a positive $41,000. In other words I owned a condo for five years and even with all I paid in costs, I’m still $41,000 ahead. That’s better than being $40,000 in the hole over five years. You can see from this example that the breakeven point will be somewhere around 10% increase in the price of the house or a sales price of about $557,000. So, from a math point of view, here’s the question you’ve got to ask yourself. If you plan to own the condo for five years, what are the chances that in five years you can sell the condo for more than $557,000? If the chances are good, then owning may make sense financially. In my example you can sell the condo for about $515,000 in five years. That would be about the same as renting. So, your cash would go down by about $40,000 over those five years, which is about what you would have lost over five years by renting. So, just so we’re clear on that, if you sell the condo for $515,000 at the end of five years, that’s almost exactly the same as renting. Now again, if you change the assumptions, the math will change. If you assume that you could earn 5% per year on your investments, you could rent and invest the $100,000 in cash and in investments instead of using it for a down payment, so at the end of five years, your investments going to be worth over $127,000. So, I paid $144,000 in rent, I have $127,000 in savings at the end of five years. So, my net cash reduction over five years was just over $16,000, so, to compare that to buying, how much would you have to sell your house for in five years to be only down $16,000? Well, the answer’s about $540,000. So, you see how changing some simple assumptions makes a big difference. If you can earn 5% on your down payment money by renting you earn that money and renting starts to look a lot better than buying. So, as you can see there are many factors to consider. How much can earn on your down payment? What’s the interest rate on your mortgage? What will you pay in condo fees, property taxes and repairs and maintenance? If you buy a brand new condo it’s possible that repairs and maintenance will be very low because none of the appliances will need replacing in the next few years. If you buy a used condo or house it’s highly likely that you’ll be replacing a lot of stuff in the next five years. Now of course in my example I just assumed that you had $100,000 down payment, well there’s not a lot of people who are walking around with $100,000 in their pocket. If you only had a $50,000 down payment or a smaller number, then the interest rate on your interest rate on your mortgage is going to be higher. If you have less than a 20% down payment, you need mortgage insurance, which usually you get through CHMC, your lender arranges all of this. But what it means is your monthly mortgage payment is higher than the number I was using in my example. So, if you don’t have the big down payment, then the mortgage is going to cost more and the math obviously is quite a bit different. Now of course there’s a bunch of things other than just math you have to consider when you’re going through this thought process of should I buy or should I rent? Should I sell my house and rent? What should I do? Some of the non math considerations, the non financial considerations are things like security. If you are renting a condo and the landlord decides to sell it, well at some point you’ve got move out. If you’ve got a one year lease at the end of that one year lease, he can kick you out if he wants to sell it. If you own your own place, you’re in complete control, you can stay there as long as you want. What about things like painting the walls? Well, your lease might say no, the landlord takes care of all that. But if you really want to have your office painted in red or your bedroom painted in green, well if you own the house you can do whatever you want. If you’re renting, you don’t have that flexibility. What about things like pets? Well, if you own your own house, you can have as many pets as you want, nobody can say anything. But if you are a tenant, there may be rules either in your building or that your landlord has imposed saying that you can’t have certain pets. What about flexibility? If you own your house and you decide to move let’s say you find a better job opportunity in some other city, some other province and you want to move, you’ve got to sell your house. That obviously takes time, you’ve got to have a real estate agent involved, you’ve got to have people coming through your house to look at it, you end up paying real estate commissions and so on. If you are renting your house, then you’re a lot more flexible. You can say okay, I’m done, I’m out of here at the end of my lease. Here you go landlord. And if you’ve been there for a year you’re probably on a month to month lease anyways, so it’s real simple. You give your landlord 60 days notice or whatever’s required under your lease and you’re gone, no costs, no hassle. So, renting gives you in a lot of cases a lot more flexibility than if you own. What this all comes down to is your view of the future. What does that future hold? And unfortunately that’s an impossible question to answer. So, my advice is to sit down and crunch the numbers under different scenarios and it’s pretty easy to do with a simple spreadsheet, you can do it with a pen and a calculator, ask yourself some questions. The first question would be okay, what do I think my house will be worth in five years? What will it be worth in two years? What will it be worth when I decide to sell it? What do I think interest rates are going to be? Interest rates right now are about as low as they’ve ever been. Are they going to keep going down or are they going to go up? What happens if I have to renew my mortgage at a higher interest rate in the future? You want to play with all these different scenarios and that helps make it a lot clearer. I think at the very least I’d be talking to my friends who own a condo or who own a house of the kind that I’m thinking of buying, and ask them what does it cost them to live in their place. Because we’ve ignored all the other things like hydro and gas and all the other utilities and other costs. You want to have a pretty good idea of what you’re getting yourself into. Because I’ve met with a lot of people who said hey, I had no idea it was going to cost that much to own my house. I knew I could cover the mortgage but I didn’t realize about all these other things. I think the final thing about the future to consider is what are your job prospects? Are you a very secure job that you’ll have for the next 20 years with no problems? Or are you in a job where there’s the chance you might get laid off? Again, important things to consider. I’ve got some more thoughts on this as to how to make these decisions and I’m going to talk about that in the Let’s Get Started Segment but first we’re going to take a quick break. You’re listening to Debt Free in 30. I’ll be right back. It’s time for the Let’s Get Started here on Debt Free in 30. This is the segment of the show where we talk about practical advice. Today we’re talking about real estate and I’ve been giving you my thoughts on how to make the decision about whether you should buy or whether you should rent. Obviously in some cases the decision is made for you. If you don’t have any money for a down payment then it’s pretty much impossible to buy unless you want to be borrowing at massive interest rates. But if you have a down payment saved up, should you buy or should you rent? And as I went through in the first segment, the thought process is fairly straightforward, you need to start by crunching the numbers, obviously there are some non math considerations that we talked about. Do I want to be able to paint the walls whatever colour I want? Do I want to be able to have pets? Am I worried about the landlord kicking me out? Putting those aside from a math point of view, the starting point is to either open up a spreadsheet or get a pencil and paper and do the math. So, do the scenario if I rent, how much will it cost me? You want to start by assuming how long it is that you are likely to live in that particular property. So, in the example in the first segment, I assumed well, I’ll probably be here for five years. Okay, what is my rent going to be over five years? In the example I used in the first segment, I just assumed the rent stayed the same $2,400 a month for the whole five years. Obviously it will probably go up each year so maybe you want to build in a couple of percentage points each year. That’s fairly simple. The buy and mortgage scenario is a little bit different. Obviously in the renting scenario you can invest your down payment ’cause you don’t need it to buy the house. How much can you earn on that? Well, again that’s a little more tricky but you can talk to your financial advisor, you can talk to your bank and see what deals are out there. If you know you’re going to be living in the place for five years then you could lock your down payment investment, which you don’t need for the down payment, into a longer term GIC to earn some extra interest. Perhaps over a five year time period it’s worth putting it into mutual funds, ETS, the stock market, whatever. Those are all decisions for you to make. Then you do the math on the buying. The most important consideration of course is what will the house be worth in five years? And that’s an impossible question to answer. It’s very difficult because if you’ve only been watching real estate in Vancouver or Ontario, particularly the Toronto area for the last five or 10 years, you will assume that real estate always goes up, it doesn’t. Real estate goes up and then it goes down. It can’t always go up because otherwise a small tiny condo in Toronto will eventually be worth 100 million dollars, that doesn’t make any sense. At some point there’s too much supply, the costs get too high, interest rates go up, the economy goes into a recession and prices go down. I know this for a fact and I’ve told this story before, I bought my first house, it was a townhouse back in 1989. The real estate market peaked around 1987, 1988 and so I thought that by buying in 1989 I was getting a really good deal. And in the complex that I bought my condo in, my townhouse condo, just north of Toronto, the – somebody the year earlier had paid $275,000 for a unit. I was able to buy mine for $205,000. So, I thought hey, this is a fantastic deal, obviously the market has peaked and has stated to come down, I’ve got a great deal on this. Well, as it turned out I owned that condo for seven years before moving out to the Cambridge area. And over that seven year period, I lost $20,000, in other words I sold my condo seven years later for $20,000 less than I paid for it. That’s what happens in the real estate market. It goes up but it can also go down. The period back around 1989/90 was very similar to the period we’re in now here in 2016. We’d had a great run up in prices and everyone thought they would continue to go up forever, that’s not the case. They stabilize, they start to come down but then they keep coming down because now people are going okay, I better cash out. So, all those people who are buying, buying, buying and buying a second property and a rental property that help prices go up, are the same people are selling that help prices go down. So, here’s the question for you, if you buy your house can you weather the storm if when it comes time to sell it’s worth 5% or 10% or 20% less than what you paid for it. Yes, if it goes up that’s fantastic, you make lots of money but it is equally likely, particularly given how high the market is right now, that it could go down. That’s why my advice is if you are risk adverse, if you don’t want to have to worry about interest rates going up when it comes time to renew your mortgage or if you don’t want to have to worry about the house price being lower when you sell it, then the safest option for you is to rent. It may or may not make sense purely based on the numbers but from a sanity point of view, a risk point of view, renting is often a very good idea for a lot of people. Crunch the numbers, put in different assumptions and see what makes sense in your situation. That’s the Let’s Get Started segment. I’ll be back to wrap it up in a moment. You’re listening to Debt Free in 30. Doug Hoyes: Welcome back. It’s time for the 30 second recap of what we discussed today. On today’s show I talked about real estate and more specifically how you can make the decision about whether you should buy or whether you should rent, whether you are a new home buyer or whether you’re considering selling your property that you have now, cashing in, using the money to pay off debt and going to rent. That’s the 30 second recap of what we discussed today. I think there’s one other key point that we didn’t address and that’s what’s called FOMO, the fear of missing out. A lot of people are buying real estate today because they’re afraid if they don’t buy today, prices are going to up and they’re going to miss out. If I don’t buy today, by next year prices will be so much higher, I will never be able to buy a house. As I said in the first segment and in the second segment, prices do not go up forever. So, if you can’t afford to own a home today, if you don’t have a significant down payment or if you’re worried that prices may go down in the future, don’t worry about missing out. There’s nothing wrong with renting. Save your money, take whatever down payment you’ve got saved up, invest that and be quite confident that renting is not a horrible idea. You are saving your money, you’re eliminating risk, if house prices do go up, oh well, you’ve still got a place to rent, no big deal. But if house prices do go down because interest rates go up or because the economy gets weaker, you’ll be in a much better position to buy in the future. That’s the safe alternative.